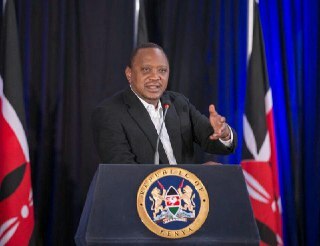 Home NEWS President Uhuru Kenyatta FULL SPEECH to the nation ahead tomorrow's vote. President Uhuru Kenyatta FULL SPEECH to the nation ahead tomorrow's vote. We have young entrepreneurs carving out our nation’s new job-creating 21st Century economy; we have mothers, battling the effects of drought to continue to put food on their family’s tables; and we have builders, forging thousands of miles of roads, railway and electricity to connect brother to brother, sister to sister, mother to son, farmer to market and business to consumer. A nation where mothers and their babies can lead healthy and happy life; where you can travel from one corner of our country to the other in hours, not weeks; and a nation where every family feels its life is safe and its property is secure. Kenya will be here long after this general election.